This is the spot for Bandana’s B-B-Q menu prices! 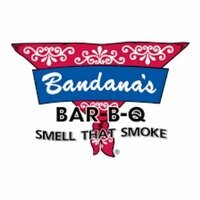 Bandana’s B-B-Q is a regional American casual dining restaurant chain serving Southern-Style BBQ items that are ‘dry rubbed’ and cooked in a smoker. Guests can expect BBQ classics like smoked barbecue pork, chicken, beef, ribs, sausage, and turkey. Barbecued meat choices are smoked between 11-14 hours to produce the unique Bandana’s flavor. Guests craving other menu choices like pasta or hamburgers will be disappointed. Bandana’s also has a Kids Menu for diners 10 years old and younger. Bandana’s is the perfect choice when planning an office meeting, social affair or corporate event. Trays of smoked meats will have guests lining up, demanding food even before it is time to eat. Whether the event calls for boxed lunches, delivery or a fully catered event, Bandana’s can supply its famous menu items. Planning an event with over 100 guests? Order in the Bandana’s Food Truck with onboard wood pit smoker. Your guests will be in awe of this unique experience. Interested guests should contact their nearest Bandana’s location for all the details and options. Guests can now bring home the great flavors Bandana’s Bar-B-Q. The online store gives fans the opportunity to purchase their favorite sauces or rubs. Why not go one step further and get decked out in Bandana’s t-shirts and caps. Bandana’s is committed to providing customers with current, accurate nutritional information for their menu items. To meet that promise, guests can visit the official Bandana’s Bar-B-Q website where they can get the nutritional information on every item on the menu. The nutritional guide includes serving size, calories, and other relevant data. For guests with gluten sensitivity, Bandana’s suggests a selection of menu items that are gluten-free. Diners with food allergies can download the allergen guide which clearly shows which allergens are located in each Bandana’s menu item. Bandana’s Dine to Donate fundraising program is a great way to raise funds for an important cause. Planning a successful fundraising event with Bandana’s is simple. Select a preferred day, choose a Bandana’s location and then invite friends and family. Bandana’s will donate a portion of the total proceeds from the event. Bandana’s will also supply a “ready to print” flyer that can be distributed for greater success. Bandana’s is a great location for team members to a great career. Bandana’s is always looking to add team members that are outgoing, hard-working and want to provide guests with a unique dining experience. Interested candidates should the Employment page on the official Bandana’s website. There they can learn about the company, its culture, and list of current openings. Everyone loves to eat and everyone loves rewards. Combine the two and you get Bandana’s with Benefits rewards program. Membership is free and guests can sign up online and receive a free order of donut holes. Guests earn one point for every dollar spent on food purchases. 100 points earn a $5.00 reward on next visit. For all the details, visit the Bandana’s website. What started out as a single location in Arnold, MO in 1996 co-founded by Rick White, has grown into 31 Bandana’s Bar-B-Q locations across 4 states. Bandana’s Bar-B-Q is a privately held company and is headquartered in Chesterfield, MO. To learn more, visit their official website.